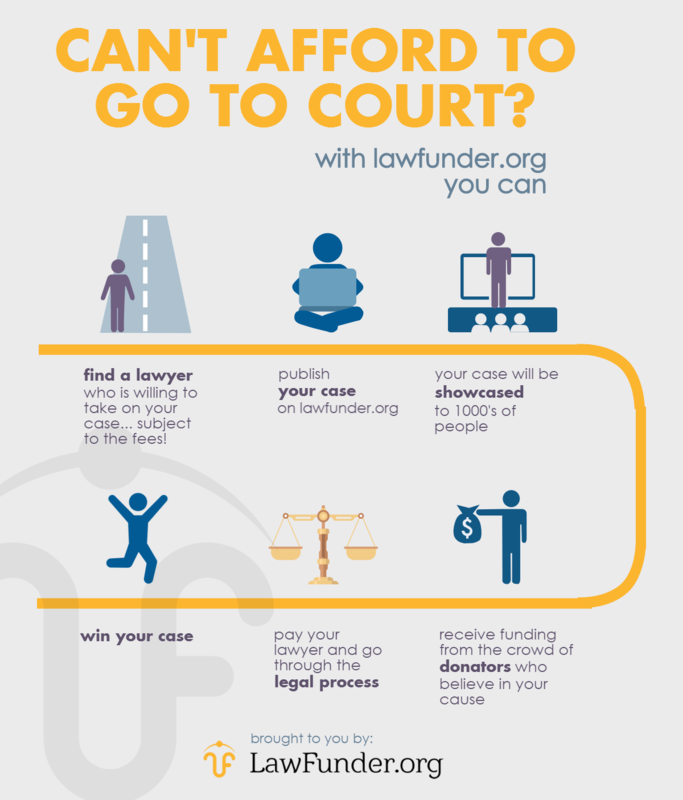 How can crowdfunding assist your access to justice? 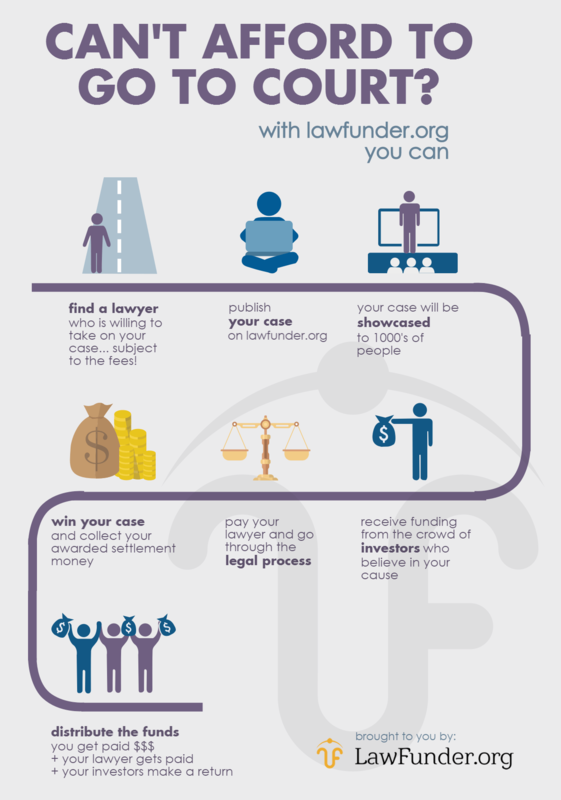 You can use lawfunder’s legal crowdfunding platform in one of two ways depending on your interests. If your cause is socially important (or just important to you), and involves something of significance other than money, you can seek donation funding to assist in your legal costs. If you wish to reward your funders for their support you may do so in a way defined by you – but this is optional. The donation model is already available all over the internet with a myriad of crowdfunding websites at your disposal. You don’t need lawfunder.org to as your platform to gain financial assistance in this regard – however, we stand as a niche crowdfunding service in the legal community. We pride ourselves on making your voice heard and stand as a carrier to receive donations for your worthy legal causes. If you are a CLC, you can create an account to run and manage individual campaigns for the people you help, or to raise funds for your centre generally – for free. If your case involves commercial litigation substantial in nature, with the potential for the award of a great monetary settlement but you cannot afford to run the trial alone, you can use lawfunder.org to call for investors. To reward your investors, you either repay them with interest when the case settles or agree to split the settlement money proportionally to the investment. This is called peer-to-peer lending. You do not need to ‘qualify’ to list your matter with us. Not only will you attract investment from typical accredited investors/financiers, you will also attract ‘the crowd’ to similarly contribute for the speculative benefit of a return. The distribution terms may be defined by you or you can use our standard terms which guarantees a minimum of 50% of the settlement/judgement award returned to you and the remainder distributed proportionally to investment. Why would anyone contribute money to your legal cause? Because they have a social conscience and care about justice. This applies to causes that generally do not seek monetary relief. These donations are tax deductible if the campaign was posted by a community legal centre. Because investing in civil litigation matters can pay hefty rewards. This applies where a substantial outlay is required to pursue a claim for a potentially large monetary settlement. How does the donation model work? The following infographic explains the crowdfunding process simply. How does the investment model work? The following infographic explains the crowdinvesting process simply. How can I list my case for investment on lawfunder? Crowdinvesting is serious business which attracts very serious investors. You need to be very well prepared if you expect to secure financial backers. Step 2: Fill out the lawfunder.org investment prospectus template. If you need help filling this out, ask your lawyer for assistance. When completed, email the form to us. A sample of a completed investment prospectus can be found here. Step 3: We will create a cause on lawfunder.org for you and attach your completed investment prospectus. Step 4: Search for investors. Lawfunder.org will approach financial institutions for investment in your litigation on your behalf, but it is equally important that you drive your own fundraising campaign. A guide on how best to fundraise can be read here. But what if I don’t win my case? Third party funders essentially provide a cash advance to litigants in exchange for a percentage share of the judgement or settlement. However, if the case proceeds to trial and the litigant loses, the third party funder receives nothing and loses the money they have invested in the case. In other words, if the litigant loses, he/she does not have to repay the money. Can’t a bank just provide me a simple loan? Commercial litigation lending is indeed a niche market in the Australian financial services industry. If you want to go down this path, Lawfunder has provided an overview and analysis of your commercial options and an overview of the benefits of using crowdfunding compared to a bank or institutional litigation lender. Lawfunder needs your help! Click here to donate to further the development of the Lawfunder platform. Paypal and Bitcoin accepted.